How Does Hip Dysplasia Affect Small Breed Dogs? 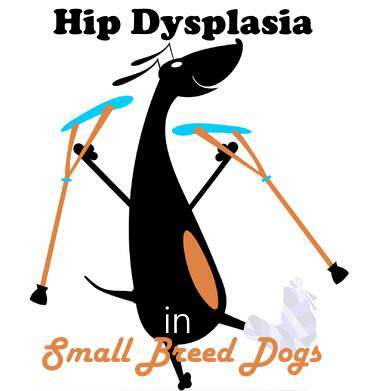 Hip Dysplasia is a dreaded disease and the most common cause of rear leg lameness in dogs. Even though it is most common in large breed dogs, it can also occur in small dogs. A quick lesson in anatomy is recommended. Feel free to click ahead, if this doesn’t interest you. In normal hips, the top of the leg bone or femur fits tightly into the hip socket of the pelvis with little room in between. The hips in both dogs and humans are made up of a ball and socket joint. The ball part is the head of the femur or large leg or thigh bone. The socket is the acetabulum of the pelvis. The top of the leg bone is in the shape of a ball. Under normal conditions, this “ball” fits nicely into its socket, the pelvis. There is slick coating of cartilage in the joint provides for a nice smooth cushioned fit and allows the joint to move freely. 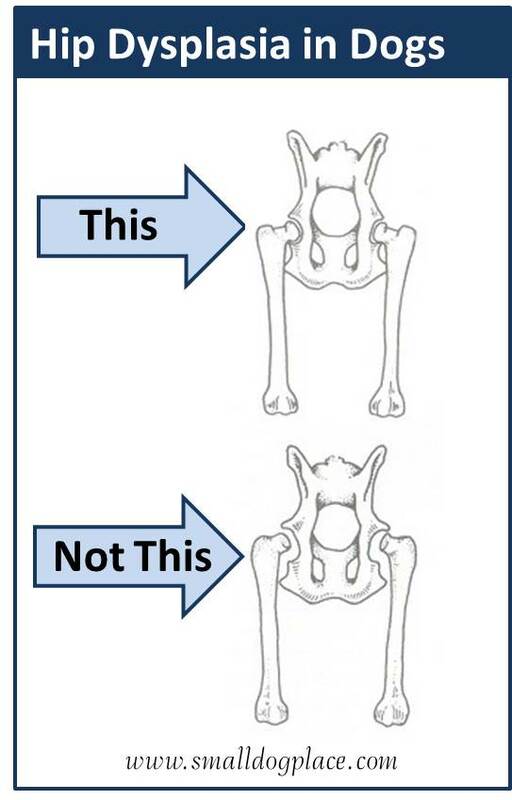 When a dog is diagnosed with hip dysplasia, the socket part of the joint or acetabulum is poorly developed and shallow. This misshaped socket causes abnormal friction when it moves. The muscles do not develop as fast as the skeletal system and, as a result, weight bearing exceeds the support of the muscle and connective tissue making the joint loose and unstable. There is more free play in the dysplastic joint promoting abnormal wear and tear. This in turn causes inflammation and pain and further damage. A vicious cycle! Hip dysplasia is thought of as a genetic disease caused by a polygenic trait. This means that more than one pair of genes is involved. There are no genetic tests for this disorder. There are, however, other factors that contribute to the problem. High calorie diet fed to growing puppies can exacerbate the problem in puppies predisposed to the disease. Rapid weight gain in some puppies places more stress on the hips. Poor diet can lead to obesity which further increases the risk. Diets that do not have the proper balance of calcium and phosphorous are bad for bone development. Inappropriate exercise during the period of rapid growth can bring on the problem, especially in puppies who love to jump up and down from heights landing on their back legs. This is especially a problem in puppies who love to jump up to catch a ball or Frisbee. Puppies are born with normal hips, but slowly show the signs of hip dysplasia between the ages of 4 and 12 months. They are listed in descending order according to OFA from Pugs being the most affected to Tibetan Terriers being least affected. In the early stages, there may be no symptoms at all. As the degeneration occurs, the first signs you might notice is in the way the dog walks. When a dog uses both of his hind legs at the same time, you might think he looks like he’s hopping like a bunny. This may not be a good sign. 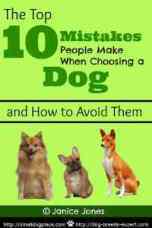 Also, the hind legs might wobble, or the dog begins to limp, favoring one leg over another. Pain and inflammation occur, but not at first. Sometimes the owner will observe stiffness after the dog arises from sleeping. Sometimes the dog will not want to stand at all, jump up on furniture or climb the steps. The only reliable way to a definitive diagnosis is an X-ray. Often the veterinarian will recommend that the dog be sedated or anesthetized to get a good quality x-ray. Unfortunately, an X-ray cannot predict the level of pain a dog might be suffering. According OFA, there are many dogs suffering with severe dysplastic hips that run, jump and play as if nothing is wrong. Then, there are dogs will little obvious changes on the X-ray that are lame, limping and in obvious pain. The veterinarian will also want to evaluate how the dog walks and moves. Other conditions can cause limping and pain including lower back problems, cruciate ligament tears and elbow dysplasia. Often medical treatment is all that is necessary to make the dog more comfortable, but there is no cure. The goal of treatment is to keep the animal comfortable while maintaining his quality of life. A veterinarian will recommend that the dog’s activity be restricted and may prescribe a medication such as a non-steroidal anti-inflammatory, to relieve pain and inflammation. 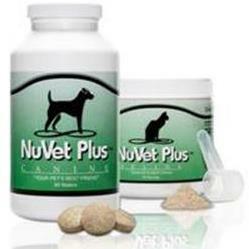 If the dog is overweight, low calorie diet will help. Sometimes a supplement such as Glucosamine is given to help with joint repair. Dogs should be exercised on a leash and not allowed to run, jump or play hard. Swimming is great if the dog loves the water. Walking on unpaved, grassy areas is easier on a dog with hip dysplasia than hard stone or paved surfaces. Pet owners can also make the dog more comfortable by providing pressure reducing beds (orthopedic foam) to sleep on, ramps and stairs for getting on and off of furniture. Other forms of physical therapy such as massage or hydrotherapy help reduce pain. Underwater treadmills can be effective in reducing swelling and pain. Usually these forms of treatment are available at university and specialty veterinary hospitals. The best prevention for puppies that may be predisposed to hip dysplasia is preventing excess weight gain and preventing the puppy’s activities, so they do not put undue stress on their hips. There are currently no genetic tests that breeders can do on the mother and father to assure perspective puppy buyers that their dog will not get hip dysplasia. There is a genetic component, but environmental factors also play a role in whether any one dog will develop hip dysplasia. There are, however, ways that breeders can begin to control the disease. OFA Orthopedic Foundation for Animals maintains a database of radiographs for pure bred dogs. At two years of age, a breeder can submit X-rays taken by their veterinarian for evaluation. The OFA certified radiologist will review the X-rays and certify the dog as Excellent, Good, or Fair and assign a number. This only allows the breeder to know what condition their breeding stock is in at the time of submission.